Reissued for September 2011 in B format. Split into two books for the paperback, the third volume in George R.R. 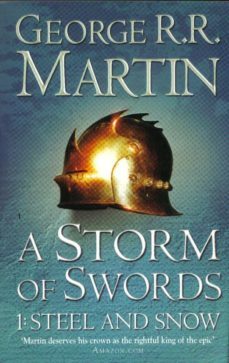 Martin's superb and highly acclaimed epic fantasy A Song of Ice and Fire continues the richest, most exotic and mesmerising saga since The Lord of the Rings. The Seven Kingdoms are divided by revolt and blood feud, and winter approaches like an angry beast. Beyond the Northern borders, wildlings leave their villages to gather in the ice and stone wasteland of the Frostfangs. From there, the renegade Brother Mance Rayder will lead them South towards the Wall. Robb Stark wears his new-forged crown in the Kingdom of the North, but his defences are ranged against attack from the South, the land of House Stark's enemies the Lannisters. His sisters are trapped there, dead or likely yet to die, at the whim of the Lannister boy-king Joffrey or his depraved mother Cersei, regent of the Iron Throne. And Daenerys Stormborn will return to the land of her birth to avenge the murder of her father, the last Dragon King on the Iron Throne.